Make your drawings look very professional by adding these beautifully detailed CAD blocks of window treatments to your CAD elevation drawings. 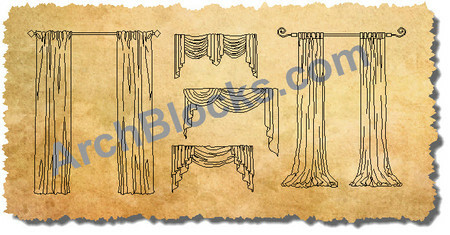 There are several styles of draperies and window shade symbols included. Get started using these beautiful window treatments symbols! Download NOW! There are 29 window treatment symbols in this CAD block library.